will ‘do it’ for you 3.Relying on ‘on demand’ video. Many large franchises are providing video on demand training. Brokers may be relieved that this is going to take training off their plates. I wish. Unfortunately, video training can provide very limited production results. Why? Because people don’t learn much by watching video. Yes, they learn a little. They observe someone else doing something; they get information. But, they don’t have to take action. constantly evolving, however my core values will always stay rock solid.â&#x20AC;? Sirlene looks forward to providing you with the highest level of real estate service excellence when the time comes to buy, rent or sell. 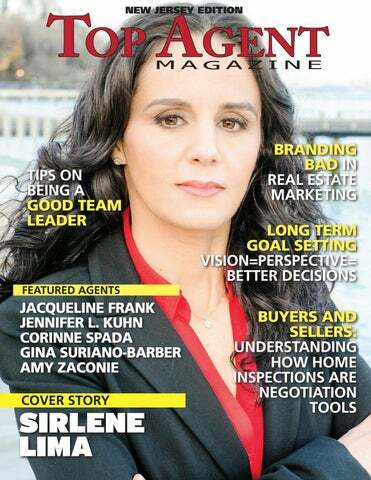 For more information about Sirlene Lima visit SirleneHomes.com, email SLima@SirleneHomes.com or call 201-600-3587 www. add to these emails’ punch is to time them so that they coincide with what that individual is going through and dealing with at that time on their path through the buying or selling process. Everyone loves to be noticed and appreciated. Schedule emails to go to each client that celebrate their purchase anniversary or birthday. Make sure you include a personal note and your own wishes that the year ahead goes well for them. If you’ve been a bit out of touch with your contacts, you might want to send them a friendly hello. MOBILE-FRIENDLY EMAILS With our phones being akin to mini computers, most people read their emails on their phone these days. So, it is particularly important to make sure that your emails are rendering well on the smaller screens. If you want to make any kind of impact, you have to run a mobile-friendly email campaign in today’s world. You are going to lose a lot of your audience if they can’t read your email on their phones. and see what your readers are actually clicking on and what elements are most popular with your contacts. Going forward you can alter different elements of your email campaign such as content, images, graphics, and even smaller elements like your subject line to draw in more clicks from your readers, and cater to what grabs their attention. You also want to follow a targeted email strategy. The best way to do this is segment your email list based on the data from your CRM and the demographics of your contacts. Different clients are going to be interested in different content. Long-time clients looking to buy a second home or possibly downsize are going to be interested in completely different content than your first-time buyers. A good way to filter your contacts is by looking at which ones are looking to buy or sell, how far along in the process they are, as well as other important information about them. DON’T SPAM UNDER ANY CIRCUMSTANCES You probably already know that flooding your clients’ emails is big no-no. However, different people have different ideas about what is too much contact. One great way to approach this problem is to ask your clients whether they would prefer weekly, monthly, or occasional emails from you. This way you can cater to each client’s preference. Now that Jennifer is a broker and has teams, she’s begun marketing herself with Facebook ads, which have been a successful tool. Potential clients see her ads and visit her website; then her administrator follows up to schedule meetings. In addition to first-time homebuyers, she specializes in new construction, farm horse property, land, foreclosures/bank-owned short sales and adult communities. She loves the whole process, from the flexibility her career affords to seeing people get into their first home, particularly if they’ve had a hard time getting there. “If you have good time management skills,” she says, “real estate is the best industry! You can set your own schedule and do well.” Even though Jennifer started young, getting her real estate license when she was just 24, she’s always been an active supporter of the community. Whether serving as president of the Farmingdale Chamber of Commerce, being voted Jackson Township County Committee Woman or serving on the ALC leadership committee for Keller Williams, her heart is in the right place. Her brother is a Marine, so she also focuses much of her time on supporting veterans with Post Traumatic Stress Disorder. When this go-getter has free time, she loves spending it with her family, especially her little nieces, one of whom is a newborn. She’s also a football aficionado, and she loves shopping and cleaning. (More than a few of her clients would love to appropriate her for that last talent.) Jennifer has a clear vision for her future, reflected in a five-year plan to build her business to the point that it runs itself. She’s made all her goals so far, so there’s no doubt she’ll accomplish this one, too. For more information about Jennifer L. Kuhn, Broker Associate Founder & Team Leader of JLK Sales Group, visit kw.com/kw/agent/jenniferkuhn, call 732.300.5630 or email jlkhomesearch@gmail.com www. The major brokerages today rely on online search success as much as any business—by promising leads to their agents they need a tremendous amount of Google Juice. So, they offer the agent leads, but also offer them a unique co-branded page or presence on their website. By having hundreds, or even thousands of agents with pages on their website, they are gaining massive website traffic (links) and having those agents pay them for it. down and focus on marketing, followed by strategic branding of the agent alone. The real estate business, or any business, comes down to two fundamental activities: finding potential clients (leads); and closing those clients (making them into customers). 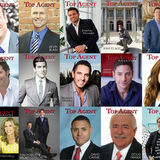 agents to increase their income. Email Rob robflitton@gmail.com at any time or call/ text him at 206-612-2314. CORINNE SPADA Corinne Spada always had an interest in real estate. After spending fifteen years as an office manager in Princeton, New Jersey, she decided to go back to school to get her Realtor’s license. “I started out part-time as an agent while working full-time at my other job,” she says. “Then I started getting busier so I made the transition to becoming a full-time Realtor.” Corinne is a Realtor at Keller Williams and she serves all of Monmouth and Ocean Counties, Jackson, Howell, and Farmingdale in New Jersey. Nearly half of Corinne’s business comes from repeat and referral clients. “I have some new listings coming this Spring, and my referrals are starting to build,” she says. What keeps clients coming back to Corinne is her dedication to providing unmatched customer service. “I’m always available to my clients 24/7,” she says. Clients remember Corinne for her reliability and for the personal nature in which she conducts business. “If they have a problem I’ll go over to the house to assist them,” she says. loves visiting the Jersey Shore, and enjoys an occasional trip to Atlantic City. “I like to travel, I’m really interested in photography, and cooking.” In the future, Corinne looks forward to expanding her business and her team. “I want to expand my growth and my sales. I have a good business plan in place and I’m really looking forward to my continued success as a Realtor,” she says. Eventually, Corinne plans on relocating to Las Vegas, where she wants to continue her work in the real estate industry for as long as she possibly can. “I hope to get my broker’s license and open my own brokerage in the future.” Corinne recently made the NJAR Circle of Excellence for 2016. She is also a member of the Keller Williams Agent Leadership Council, and she is a mentor to new agents, as well as a Keller Williams Technology Ambassador. To learn more about Corinne, visit: realtorcorinnespada.com or call Cell: 732.757.1178 Office: 732.942.5280 x242 Email: cspada@kw.com www. and we really are able to connect and create a bond that lasts.” Considering Amy’s close ties to her clients and exemplary rate of transactional success, it’s little wonder that the vast majority of those she works with are repeat and referral customers, many of whom are generated from word-of-mouth recommendations—high praise indicative of Amy’s authentic ethos. Her knack for the interpersonal translates organically to her larger community as well, where Amy honors a variety of causes, including a role within the National Council of Jewish Women. As an animal lover and former owner of Great Pyrenees show dogs for twenty-seven years, Amy now contributes to dog rescue efforts in her area, too. Having worked in the housing market long enough to recognize the continual tide of change that flows through it, Amy also devotes her time to continuing education, staying sharp and atop the market she’s flourished in for years. As for the future, Amy fosters plans to continue to grow her business, develop her personal investment properties, and meet even more of the vibrant clientele that energize her work. “I meet people from all over the world, from all different walks of life,” Amy reflects. “People buying a home are realizing the American Dream. I’m so honored to meet these families who work so hard and can achieve this milestone. I love being a part of those priceless moments.” With decades of hard-won experience and knowledge under belt, along with her infectiously positive philosophy on life, the years ahead are sure to remain bright for Amy Zaconie. Accomplishing longer term goals not only gives the rewards of whatever the goals are about, but on a higher level creates the positive self esteem and confidence of accomplishment. Confidence comes from creating victories. Those in therapy, or should be in therapy, experience control issues (usually a lack of control). When you’re in control of your life you generally make better decisions, feel more alive and healthy and usually become a more compelling figure to those around you. Copyright©, 2015 Barry Eisen. All rights reserved. Board of Realtors. She was thrown into it not knowing what it entailed, and for two years learned the importance of networking and community service. “I organized myriad events and enjoyed doing it,” she says. Since then, she’s collected school supplies for kids in need, volunteered for the Boys and Girls Club and repainted rooms, among other things. This year, she’s been selected by the state to serve as Vice Chair of the New Jersey Realtors® Young Professionals Network, and she has been selected to serve on the Board of Directors for the Eastern Bergen County Board of Realtors. A dynamo who doesn’t quit, Jacqueline keeps her eye on the less serious side of life by feeding her foodie nature, trying as many local restaurants as she can. She also loves to travel as much as she can. She’s extremely happy where she is in life today but always wants to keep growing, learning and offering a better product to clients. And eventually, it’s quite likely she’ll follow in her mother’s footsteps and become a broker/owner. For more information about Jacqueline Frank of CENTURY 21 Gold Advantage, East Rutherford, New Jersey, visit JacquelineSellsHomes.com, call 201.446.3246 or email jacquelinefrankc21@gmail.com www. the small communities she services and often meets with her clients while dining and shopping locally. The connection she is able to forge during these meet ups helps to keep her name forefront in the minds of her clients. “I keep close contact with my clients so they just naturally think of me when they’re looking to sell or buy again,” she says. When it comes to listing a home, Suriano-Barber has an edge in the social media department as she is technologically savvy and uses the latest media platforms to promote her homes. From Facebook to Instagram, she uses every opportunity to get the word out about a home she is marketing to ensure it gets the most exposure. She employs an assistant, stager, and professional photographer. Suriano-Barber is persistent in assisting her clients with the highest level of service, while keeping the home buying process a pleasurable one. As a local to the area, Suriano-Barber is involved in the schools her children attend and the activities they participate in. She is also a fundraiser supporter of charities that have impacted her family including diabetes and ALS. When she has some free time, she really enjoys traveling with her family. As she moves forward with her business she will continue to implement the latest tools for her marketing efforts as she keeps an eye out for the latest in technology and market trends that can help her business. She also wants to continue to be the “go-to” person in her community for all residents and use her local knowledge to its full potential. For more information about Gina Suriano-Barber, visit GinaSellsNJHomes.com, call 908-917-4577, or email gina.surianobarber@cbmoves.com www.